Mao Zedong, leader of the revolution and absolute chairman of the People's Republic of China, was also a calligrapher and a poet of extraordinary grace and eloquent simplicity. The poems in this beautiful edition (from the 1963 Beijing edition), translated and introduced by Willis Barnstone, are expressions of decades of struggle, the painful loss of his first wife, his hope for a new China, and his ultimate victory over the Nationalist forces. 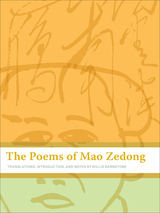 Willis Barnstone's introduction, his short biography of Mao and brief history of the revolution, and his notes on Chinese versification all combine to enrich the Western reader's understanding of Mao's poetry. Mao Zedong was born in Hunan Province in 1893, son of an impoverished peasant. In October 1949, he founded the People's Republic of China, which he led until his death in 1976. Willis Barnstone is Distinguished Professor of Comparative Literature at Indiana University, the author of many books, and a noted translator.